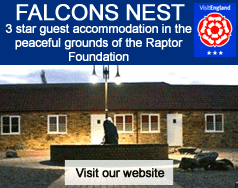 This full day experience is designed to give you an insight into the needs, housing and care of a bird of prey including flying and handling owls, hawks and falcons and can be tailored to suit you. You will be greeted on arrival and taken for tea or coffee, this is where you are introduced to your falconer for the day and he takes you through a brief safety talk. Now onto the best bit because we all know handling and flying the birds is the exciting and thrilling part of the day. You will get to handle some of the most majestic and fascinating birds including the Barn Owl, European Eagle Owl, Kestrel, Buzzard and much more. The theory of falconry and the equipment used will be explained during the course of your day. Now its time to get the heart racing, as we get ready to fly. There is no better feeling than having a bird of prey land on your fist. Whether it’s a small owl or an eagle the buzz is something you will remember forever. To round of your day you will get a certificate of completion and a photograph of you holding a bird of your choice (within reason). Price £80 (All of our experience days are on a one to one with a trained falconer and one free guest can accompany you) Gift vouchers available.